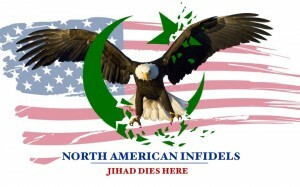 A North American Infidel, Bare Naked Islam, Infidel Task Force Action Alert! As I have stated over and over, Muslims have successfully turned our freedoms into tools of Islam. Their three main targets being the educational system, the media, and our politicians. One of the organizations on the forefront of misleading America on Islam is the Muslim Public Affairs Council., (MPAC), and they have just launched a social media attack on the naïve and trusting non-Muslims they prey on! (Washington, DC – 8/7/14) –Today, the Muslim Public Affairs Council (MPAC) launched a social media campaign called “#ISpeakOutBecause” to provide a platform for people of conscience to speak out for human rights. Speaking out in response to escalating violence and extremism taking place in Palestine, Iraq, Syria, Myanmar, Nigeria and beyond is a critical step to spreading awareness and creating change. In recent weeks, many public figures have spoken out against the ongoing injustices in Gaza, only to face sharp criticism and pressure to retract their statements. Intimidation has led many people to practice self-censorship on topics deemed taboo out of fear of ramifications. When we are intimidated into censoring ourselves, our right to free speech is threatened. Of course their campaign is going to be a complete whitewashing of Islam, while attempting to turn the tables on Israel for defending herself from the genocidal tendencies of Hamas and other jihadists. In order to win the war with Islam we must win the information war. We must negate the social media campaigns that mislead the public on Islam. So in an effort to do that North American Infidels (NAI) is proudly locking arms with our friends at Bare Naked Islam (BNI), and Infidel Task Force (ITF). The mission is counter the MPAC campaign, and we need your help! We ask that you please join us and add the #ISpeakOutBecause hash tag whenever posting about Israel defending herself, Islam, or women’s rights, etc. (Facebook now uses hash tags as well.) You can add to it by contacting news agencies, media personalities, or even MPAC itself. Let’s them know the truth team is alive and kicking! Please be creative, not threatening! MPAC excels in describing Islam as they would like it to be — full of Western humanitarian values and interfaith tolerance. However, when it comes to citing un-abrogated texts from the Quran to support their position, they are silent. The quickest way to silence their “speak out” campaign is to simply ask them, where does you sacred text say that? (Any text dating before the Muslim migration to Medina in 622 was most likely abrogated by Surahs 8 and 9 — Muhammad’s final revelations. ).